Judson Hale grew up in Virginia, and while earning a degree in plant biology at a Georgia college, developed an interest in wine. His passion led him to a degree in viticulture and enology from University of California at Davis and a program in Dijon, France where he me his future spouse, Lisa. 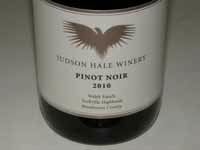 Judson and Lisa founded the Judson Hale Winery with other members of the Walsh family to produce Burgundian style Pinot Noir and Chardonnay. The Walsh Vineyard was planted in 1996 by Dennis and Mary Lou Walsh on their 250-acre Yorkville Highlands ranch with almost everyone in the Walsh and Hale family tending to this family endeavor. The vineyard is planted at 1,400 foot elevation. Natural spring water nourishes the vines during the late summer months. A winery built on the Walsh's Yorkville ranch has a planned opening for the 2013 harvest.